History has shown us that true visionaries, like Steve Jobs and Thomas Edison, saw things the rest of us didn’t. And history is marked with episodes of their frustration as they tried to tell the public of their grand plans to no avail. And so it is in that context that we approach the seemingly off-the-wall request by PSJA ISD Superintendent Dr. Daniel King to convert his entire school district into a “charter school” status by the start of school in the fall, in a quirky and innovative play for more state funding. King says that by doing so, the district would receive $28 million in additional funds each year, which equates to about $906 more per student. This would be possible by tapping into a loophole in a bill passed by the Texas Legislature in 2017 that allows public school districts to contract with open-enrollment charter schools or other education institutions in order to turn around underperforming campuses. In doing so, these campuses would receive funding equal to that of charter schools. That’s the upside. The downside is that the district would give up control of every campus that adopts this status, and that has some teachers and community leaders confused and unhappy. To his credit, King has been holding daily, public sessions to explain his plan. But he’s not explaining it very well, or perhaps the community doesn’t believe his idea is fully flushed out because he is being openly met with opposition from teachers, parents and community leaders. We, too, question how this plan will play out for the district’s 32,000 students. And we need more details. We also wonder why he waited so long to bring this up? Every day that he falls short in getting community buy-in, he is jeopardizing his plan because he is running out of time. We commend Dr. King for once again demonstrating his ability to think out of the box. He is renowned nationally for his innovative ideas that have, in the past, always put his students and teachers first. He truly is a visionary and PSJA ISD is lucky to have his talent. But we worry about money being the main driver for this new undertaking. We also have concerns about the third-party nonprofit organizations, which he said would be overseeing the charter-status campuses, that have yet to be formed or even named, much less explained. King calls his plan EmpowerED and he says it will help teachers innovate and take charge of their own campuses. But staff at each campus must approve the plan, he said. If passed at a campus, King said a steering committee would be formed and each would chart the direction for that campus, determine ways they want to innovate, increases in teacher salaries, and academic goals. He also says up to seven Innovative Management Organizations (IMOs) will be formed from nonprofit education organizations to oversee clusters of campuses. But those IMOs have not been named, and that’s partly because King said he wants community input. 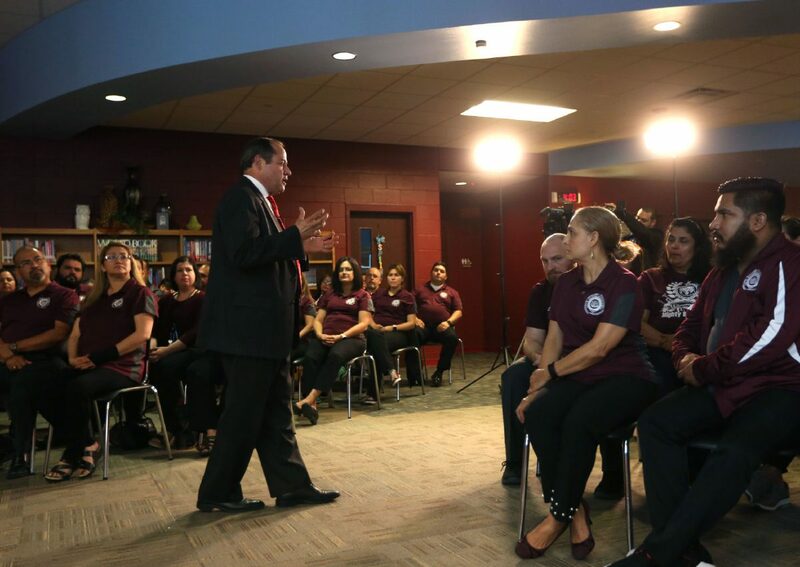 At Monday’s meeting, King casually mentioned a respected former PSJA ISD principal who he thought could run this venture by forming a new nonprofit organization, but he didn’t say whether he is in talks with her, or what her salary or requirements would be. He also mentioned that the district plans to utilize their human resources and accounting personnel to oversee the finances at the nonprofits. And that is where the cart could be coming before the horse. Because if King doesn’t get community buy-in to a plan that he says he wants to be community-run, then it will not go forward. But with less than a month to get teachers to vote on this (otherwise he says he won’t do it) and to submit it to TEA for approval prior to the start of the 2018-19 school year, he is clearly running out of time. Given the hoops that Waco ISD went through this past year to launch a similar type proposal that also plays off of a loophole of Senate Bill 1882, we doubt King will be able to pull this off. Waco ISD Board of Trustees President Pat Atkins told us that TEA just on Monday approved their request to allow a nonprofit to run five of its district schools that were underperforming and facing closure by this fall. The application process began a year ago, he said, and they have named an established and respected nonprofit organization, Prosper Waco, to oversee the campuses in order for them to get a two-year reprieve to bring up performance at those schools. The Prosper Waco board included the city’s mayor, Atkins, as well as the CEOs of the area’s two largest hospitals, Providence Health Center, and Baylor Scott & White Medical Center. And in order to get TEA approval, ultimately Atkins and another member had to give up their voting member status on Prosper Waco, so as to have no conflict of interest. King said he bluntly asked Morath whether, as commissioner, he would financially support King’s idea if staff at the district’s campuses vote to approve the measure, and he said Morath agreed. King has said that even if just one of the district’s 43 campuses approve the plan then he will put in an application with TEA and try to implement it at that campus. As to the timing, King said it’s very possible that the 2019 Legislature will rewrite that law and close that loophole and so he urges that now is an opportunity to apply that might not exist a year from now. He understands it might be rejected, but he said there will be nothing gained if they don’t try. Spoken like a true visionary.